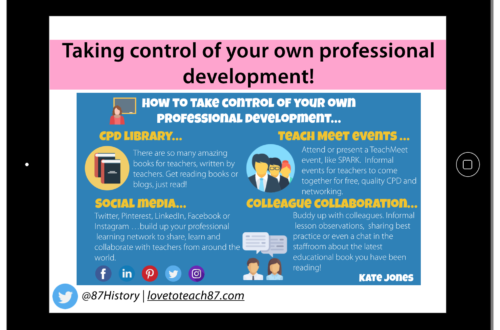 In recent years teachers have started to take more control over their own Continuing Professional Development. Schools are also becoming much more creative as to how they deliver CPD to staff too. As educators we fully understand the importance of continuous learning and progression, therefore we really value and fully embrace CPD opportunities. 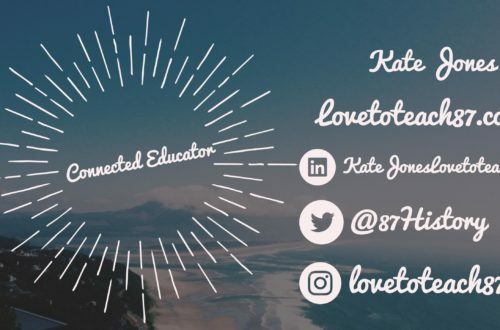 Thousands of teachers across the globe have taken to social media, such as Twitter and Pinterest, to receive instant CPD online whenever they want to access it using an international platform, forum and professional learning network. 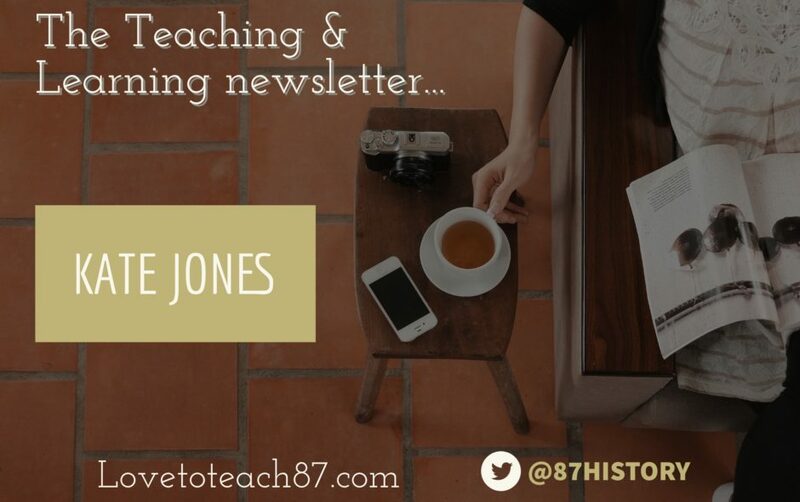 It was on Twitter that I discovered the idea of creating and sharing a newsletter for staff focused on sharing teaching practice, advice and resources with colleagues. This idea of a newsletter/ leaflet really appealed to me because I am very passionate about sharing teaching and learning ideas and keen to learn from others. I also liked the idea of teachers being able to easily find out what their colleagues were doing in their classrooms in a very simple and accessible way. Feeling inspired I decided to create a teaching and learning newsletter to be distributed across the College where I am currently teaching. First, I approached the College Leadership and Senior Leadership teams with the idea and provided an example of the newsletter that I had created for the first edition. I am very lucky that I work in such a positive and enthusiastic environment where ideas and suggestions are welcomed and celebrated! The leadership team agreed to the idea and with their support, help and encouragement I launched the first newsletter! If this is an idea that you would like to introduce with your colleagues or find out more about then I have provided some information below about the newsletter I created. Obviously, these are only suggestions as every school is different and the newsletter should reflect the values, ethos and teaching of the school. What do I include in the newsletter? Every month the newsletter will have the same or similar format with the features shown below. Teachers know what to expect from the newsletter and there may be different sections that appeal more to some teachers than others. The content is focused on pedagogy rather than subject-specific content although I am aware of some departments in different schools having their own subject-specific departmental newsletter. 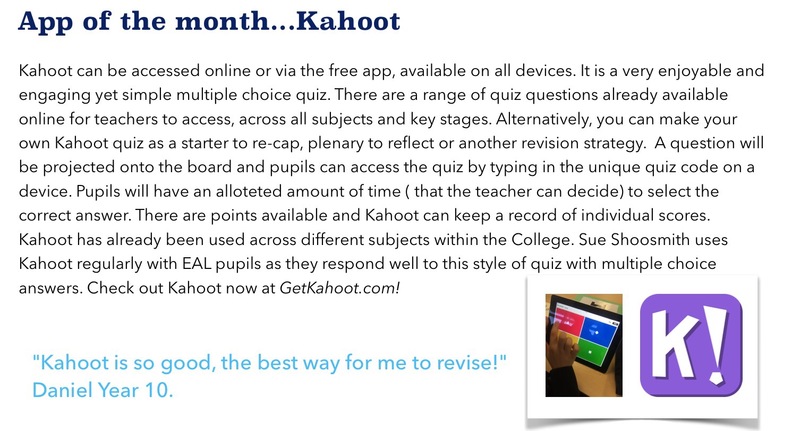 App of the month – I completely embrace technology in my classroom, therefore, I have a long list of apps that I would recommend! At my College we have access to iPads, therefore, this is relevant to staff but may not be at other schools. In addition, after many discussions with staff they too have recommended specific apps to use in the classroom. For this section, I provide a brief overview of the app, how it works and examples of how the app has been used as either part of my planning or within the classroom. The apps I have suggested so far include: Google Expeditions, Kahoot, Plickers, Tellagami and Wordfoto. Suggested website – Based on the feedback I have received this is the most popular feature of the newsletter. Some teachers have informed me that they go straight to the recommended website section then check it out for themselves. My focus is to share websites that provide a range of teaching and learning resources. Most, if not all, teachers are familiar with the TES for resource downloads so I am trying to provide some great alternatives that I have used. So far the suggested websites have included Trythisteaching.com and Classtools.net as both provide a wealth of innovative resources that can be easily used within the classroom. 100 Ideas (Secondary) by Ross Morrison McGill & 100 Ideas (Primary) by Stephen Lockyer. Making every lesson count: six principles to support great teaching and learning by Shaun Allison and Andy Tharby. Resource of the month – I try to be very creative when it comes to classroom resources! I have a wide collection of resources that are my own original tried and tested ideas or that I have collected from other teachers. The difficulty with this section is trying to cater for all teachers as the College ranges from Foundation Stage to A-Level. Therefore I try to share cross-curricular resources that can be used across a range of subjects and easily adapted for different year groups so everyone can benefit. 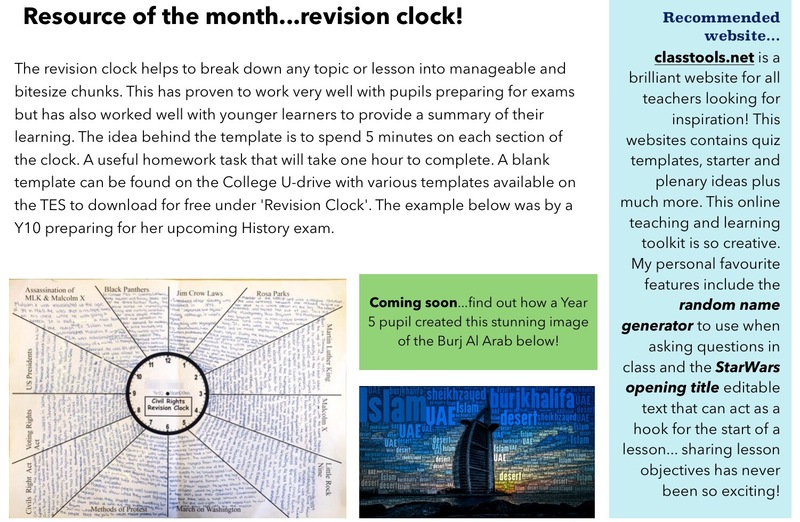 The revision clock below is a resource which is credited to @Teachgeogblog and can be downloaded for free here. CPD events in the area – Recently I attended my first SPARK event, which are free TeachMeet events that take place across the UAE. The newsletter provides an opportunity to share and inform colleagues of any educational events taking place within the area. In the UK you can search on the TeachMeet website to find out what events are taking place all over the UK from TMBett to local Teach Meets hosted by different schools. In addition, I share any useful hints and tips that can help with planning, behaviour management, ICT and so on! I include a ‘Coming up…’ section suggesting what will appear in the next edition and something to look forward to! Learner voice is very important so I try to include feedback and quotes from pupils with their opinions about what works for them or what they enjoy. The newsletter is a great opportunity to share what other teachers are doing across the College from FS1 to Year 12! How do I create the newsletter? I decided to use the Apple app Pages on my iPad. This app does cost but I use it regularly and is another one of my app recommendations. It is a very simple, quick and easy way to create a high quality and sophisticated documents on ios or Mac. Alternatively, you could use Word or Publisher – whatever works best for you or that you are familiar with. I convert the Pages document into a PDF to distribute and print (it needs to be converted to PDF so everybody can access the document). To further save time I have a template that I will use for every edition so the layout will remain the same just the content will vary and differ each month. When and how is it distributed? I originally wanted to create a weekly or fortnightly newsletter but it was suggested I create a monthly newsletter so that it didn’t become a workload issue. I agree this is a much better idea (I am very grateful for that suggestion too!). Currently, I create the newsletter on my own but I have asked for volunteers to contribute. If a group of people are working on the newsletter then perhaps it could be published more regularly but if not monthly is a good idea, as it is not impacting my current workload and obviously I have other priorities as a teacher. At the start of the month, I distribute a digital copy to all staff via e-mail and that is useful as I can also include any digital attachments of resources or website links that are featured in the newsletter too. 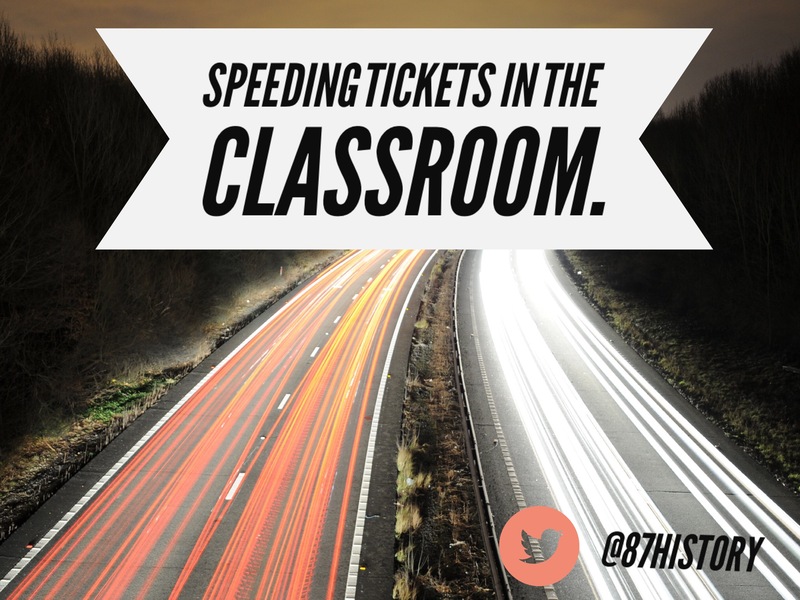 There are also some hard copies printed out and placed in the various staff and workrooms. I have seen many teachers on their break, sat with a cup of tea having a quick read and gaining some nice takeaway ideas for their lessons! Below highlights some of the positive feedback I have received from my colleagues (I already mentioned that I work with such a kind, supportive and encouraging group of teachers!). “A great idea Kate, well done. I’ll keep it in mind to contribute”. 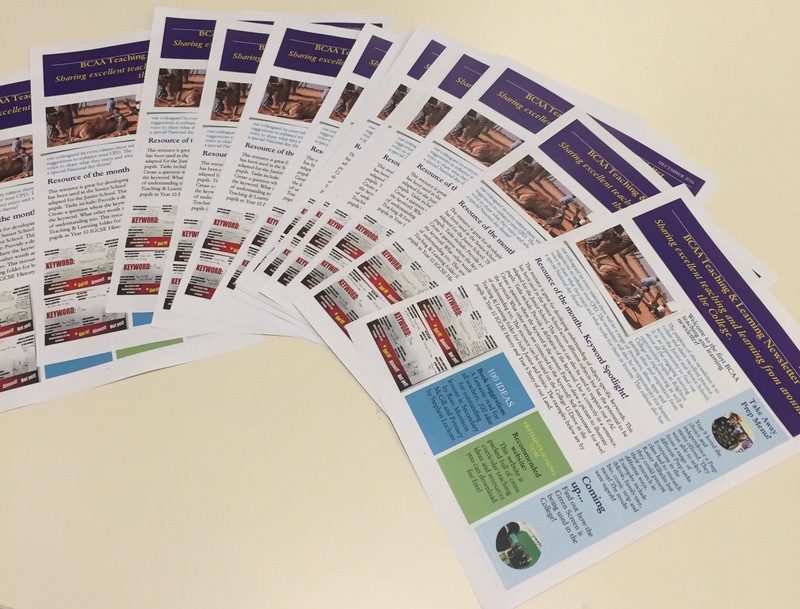 “Well done on producing the newsletter – looks fab! It’s a great way to share ideas and best practice”. “Thank you for sharing. If you would like contributions please let me know”. Good luck with your newsletter and I hope you have found this useful. If you have any further questions or suggestions please do not hesitate to get in touch. You can get in touch via my contact page or you can drop me a message on Twitter. Great idea. Is there any chance I could see a copy as thinking of this for my school?